Employment growth in metro Denver may be tapering off, but as of November, home prices certainly weren't. According to Case-Shiller's report for November, released last week, the Denver home price index was up 10.8 percent, year over year. 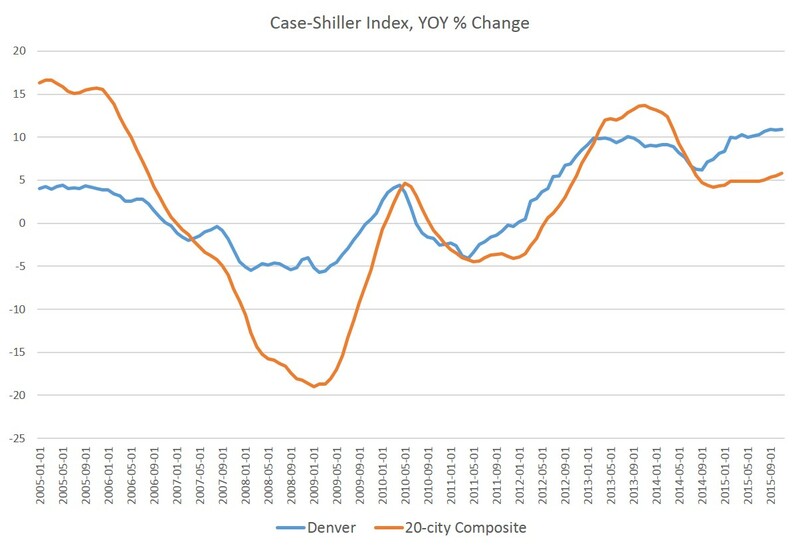 That's down slightly from September's 10.9 percent YOY increase, which was the largest increase seen in the Denver index since 2001 at the end of the dot-com boom. While the highest YOY increase recorded in the past 20 years was 14 percent in 2001, November's growth rate of 10.8 percent is nevertheless a very large increase. 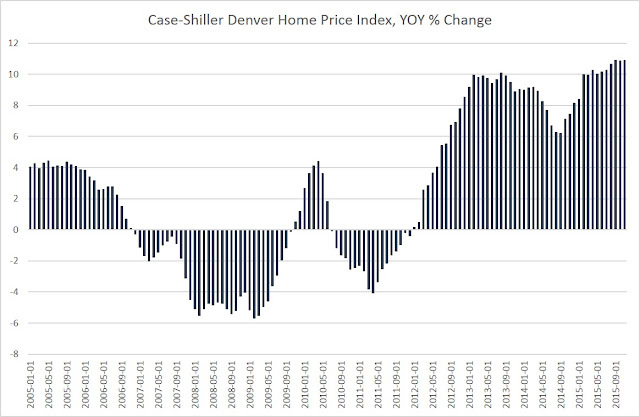 Denver's home price growth is outpacing the nation overall as measured in Case Shiller's 20-city index, which showed a year-over-year increase of 5.8 percent for November. As Colorado has had stronger job growth than the nation overall, it is not shocking that home price growth has also exceeded the nation overall. A better job market has brought more demand both from people who were already here, and from new residents relocating for work. Based on median income data, though, it's safe to say that home prices have indeed been outpacing incomes, which creates an affordability issue, and a question as to how sustainable the home price growth can be.